One of the first prominent rock session musicians of note and one of the great pianists of the 20th Century in any form of music, Sammy Price is a tragically under recognized figure when it comes to receiving proper credit and widespread acclaim for his contributions to the musical landscape. Born in Texas in 1908 Price gained notice for his abilities while in his twenties playing primarily in Dallas where he also was known for both singing and dancing as well as his skills on keyboards. He was soon featured on regular broadcasts from Oklahoma City and through that exposure moved to Kansas City, one of the most vibrant musical territories in the 1930’s. Before turning thirty years he old he was hired by major label Decca Records as a session musician and he became arguably the most reliable and versatile figure in that role on any label of that time. 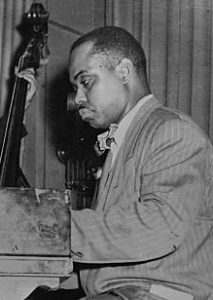 His work knew no stylistic boundary, as he played behind jazz legends Mezz Mezzrow, Sidney Bechet and Lester Young, gospel queen Sister Rosetta Tharpe, blues acts like Trixie Smith and Jimmy Rushing and eventually transitional rock artists such as Cousin Joe and Albennie Jones, in the process helping to write many of their songs, to oversee their arrangements and anchor the heavy rhythmic styles rock became known for. His versatility however all but ensured he’d never commit fully to any one genre and true to form he toured Europe with jazz musicians and yet by the mid-1950’s was out front cutting storming rock instrumentals with his longtime crew, The Texas Bluesicians. A bright and ambitious man Price owned nightclubs in Texas along with a meat packing business (the aptly named Down Home Meat Products) and by the 1960’s was active in Democratic politics in New York as a campaign organizer and Civil Rights advocate. He remained active in music long after his session work dried up due to changing times, able to perform in any style for any audience while acting as a vital link to eras in danger of slipping into history. By the 1980’s he’d settled into a regular gig in Boston’s historic Copley Plaza hotel and in 1991 he played a noteworthy jazz performance at Carnegie Hall. He died the following year at the age of 83, never a big name star in any field of music but a valued addition to every genre he was involved with and a crucial element in rock’s birth. As sideman… behind Cousin Joe. As sideman… behind Albennie Jones.